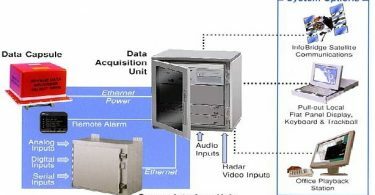 Radar is an object-detection system designed for detecting and tracking objects (targets) at considerable distances.The word radar is an acronym derived from the phrase Radio Detection And Ranging. A radar system has a transmitter that emits radio waves called radar signals in predetermined directions. When these come into contact with an object they are usually reflected or scattered in many directions. The radar signals that are reflected back towards the transmitter are the desirable ones that make radar work. Radars transmit directional microwave radio pulses with a rotating ariel (the scanner) in a 360º circle around the machine. It detects the bearing and range of echoing pulse returns from significant surrounding targets to produce a map like display. Considerable power is required by a radar for transmit mode, of up to 400 watts even in the smaller sets. The supply is usually a small solid state power pack or motor alternator or a generator with larger sets. Super high frequencies of electromagnetic energy waves (3000 to 10000 MHz, these are wavelengths of 10 and 3 cm, respectively) are produced in the oscillator. The operating cycle of the oscillator is initiated by the trigger, which determines the pulse repetition frequency (PRF). The pulses are shaped in the modulator, which determines the pulse length, then passed to the magnetron, which converts the energy into radio waves and determines the radar frequency. They are then passed to the transmitter, which in modern radars is usually combined with the receiver (the transceiver). The transceiver is usually located within the scanner unit. The pulses are transmitted to the scanner unit by the waveguide. A waveguide is hollow copper tubing, usually rectangular in cross section, having dimensions according to the wavelength of the carrier frequency. An electronic switch in the waveguide, called the transmit/receive cell (T/R) isolates the receiver during transmission to protect it from the high power of the transmission. In modern radars the waveguide and the T/R switch are usually located within the scanner unit. 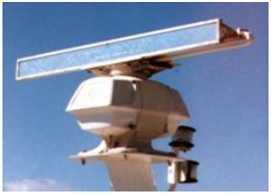 The most common type of radar aerial, the open array scanner is shown below. 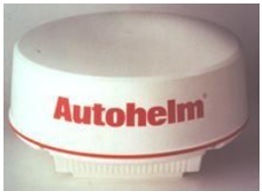 Scanner can be housed within a radome as below. This particularly suits yachts as the rotating scanner can turn without fouling sails and rigging. The scanner unit radiates the radar pulses and passes returning target echoes to the receiver. The scanner also focuses the outgoing microwaves into a tight beam in much the same way as a torch reflector focuses the light from a bulb. This is done in most marine radars by feeding the microwaves into a hollow tube inside the rotating scanner, which is also called a waveguide. The waveguide is sealed at both ends but has a series of small slots in one side. Each slot acts like a small aerial but their combined effect is to focus the microwaves into a narrow beam. This type of scanner is called a horizontal slotted waveguide. The length of the scanner will determine the radar’s horizontal beamwidth (HBW). A wider scanner will result in a narrower beamwidth which will produce better bearing discrimination. The inside of a horizontal slotted radar scanner is shown below. In every revolution of the scanner, radar pulses hit the target not once but many times during the time it is aimed at the target. The effect on the screen is cumulative, the more hits the brighter the target appears on the screen. Should insufficient pulses hit the target only a weak echo will be displayed and it will disappear quickly. The number of scanner revolutions should be between 20 and 30 revolutions per minute in order to both display the target brightly and prevent the disappearance of the picture between scanner revolutions. Most scanners operate at 24 rpm. A more recent innovation is the patch aerial. This aerial uses a printed circuit consisting of an array of copper pads, to focus the beam. With an analogue radar, a motor rotates the scanner at approximately 24 rpm and a signal from the time base unit to the display unit causes the trace to rotate in synchronisation with the scanner. As the scanner passes the fore-and-aft line, a heading marker will appear on the display. Digital radars use microprocessors to add heading and timebase information to the display. The receiver unit detects incoming echoes which are at more or less the same frequency as the outgoing frequency and mixes them with a signal from the local oscillator to reduce them to an intermediate frequency, usually about 60MHz. The signal is then amplified by the IF amplifier, weaker distant targets are amplified more than stronger/closer targets and is passed to the video amplifier, which converts the signal to a suitable form for video display. The signals are then passed on to the display unit, with the addition of range and bearing marker signals. The receiver in modern radars is combined with the transmitter and called the transceiver. It is usually located within the scanner unit. Analogue type (older) radars consist of a cathode ray tube (CRT), the face or screen of which is commonly referred to as the scope, and various timing circuits and controls. In the scope a stream of electrons is directed towards a fluorescent screen. The phosphorus glows when illuminated by the electrons, while internal circuitry forms the trace or sweep. A beam begins at the centre and sweeps out again and again, each sweep corresponding to the progress of a microwave pulse going out and back, and each successive sweep moving a little further around the screen in time with the rotating scanner. A returning echo is added to the sweep signal so that the screen is more brightly illuminated (painted) at a point corresponding to the bearing and range of the targets echo. This produces a very clear but very dim picture and the scope is fitted with a cowl to allow daylight viewing. This presentation is called a Plan Position Indicator (PPI). 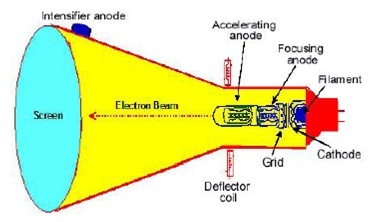 The diagram above shows a cathode ray tube (CRT) using magnetic deflection obtained from coils placed around the neck of the CRT-other CRT’s use electrostatic deflection, by use of deflection plates. Modern displays units, called raster scan radars (colour radar) use microprocessors to analyse echo range and bearing and present like a TV. The raster scan picture (paint) is rectangular rather than a circular. In raster scans there is no rotating trace, instead the echo is digitalised and painted line by line across the screen (called interlacing). As the sweep moves across the screen the pixels (picture cells) are illuminated and can be further electronically enhanced in colour or duration of illumination. A small rasterscan radar is shown below. To obtain a sharp image a high resolution is required. Resolution is measured by the density of the pixels, the more pixels per square inch the higher the resolution. A common radar display resolution of 640480 means that the screen consists of 640 columns by 480 rows of dots, that is, 640 x 480 = 307,200 pixels. Pixels are electronically refreshed or updated so they will remain bright, at a rate of about 30 or more times each second. Displays may be interlaced or non-interlaced. Interlaced displays do not draw the entire picture in one pass. On the first pass, it draws every other line and draws the remaining lines on the second pass. Non interlaced displays will therefore be more stable. On early model raster scan radars piccolos were either on or off, which meant that there was no visible difference between a weak echo and a strong one. This could result in weak echoes like rain clouds completely blocking out the display and masking targets within the blocked out display. Later models have multi-level quantisation displays, in which each pixel can operate at several levels of monochrome, which allows the operator to distinguish between a weak and a strong echo. On modern rasterscan radars remote displays or full dual displays units are available. 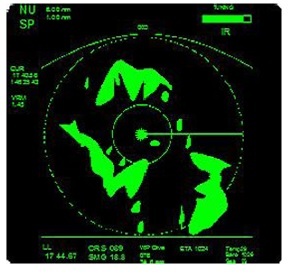 Most radars produced for small craft today have a green and black monochrome quantised display. However, some of the larger more expensive radars feature full colour displays. Most radars today are capable of interfacing with other navigational equipment, such as GPS, electronic compasses, logs, sounders, weather instruments, engine instruments and autopilots. 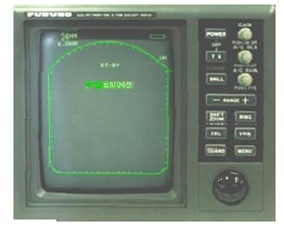 For example, when interfaced with a GPS navigator, electronic compass and log, the position and vector of any radar target on the screen that has been acquired by the ARPA (Automatic Radar Plotting Aids) can be digitally displayed on the chart. In order to interface the instruments must be able to communicate with each other in the same software language. To allow this most manufacturers have adopted a standard code defined by the National Marine Electronics Association (of America). A later version of this standard is NMEA-0183. 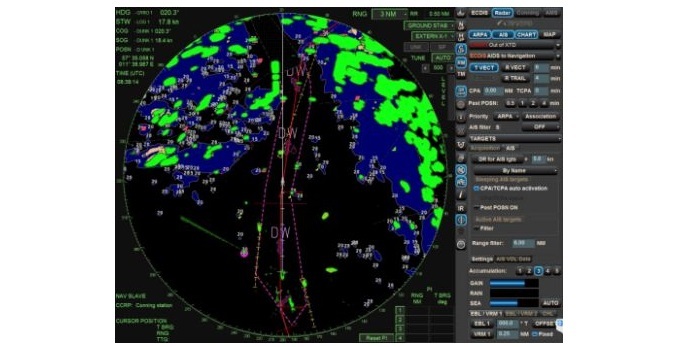 The above figure shows a north-up radar display interfaced with the GPS and other instruments to give own ship’s position, position of target acquired by the ARPA, SMG, CMG, waypoint information, air temperature, sea temperature and barometer reading. Radar wavelengths are expressed in centimetres, the commonest commercial marine radar being 3 cm (actually 3.1 to 3.2 cm). This corresponds to a frequency of 9300 to 9500 megahertz (millions of cycles per second) and is called X-band radar. A 3 cm radar requires a smaller scanner to achieve the desired beamwidth and definition as compared with a 10 cm radar. X-band radars are particularly suited to coastal navigation and pilotage due to their high picture definition and quality. On the negative side a 3 cm radar produces more side lobes than a 10 cm radar and the radio waves are not as refracted to the same extent. Therefore they will not achieve the same range as a 10 cm radar. Another common marine radar wavelength is 10 cm (actually 9.2 to 10 cm) with a frequency of 3000 to 3246 megahertz. This is known as S-band radar. A 10 cm radar will require a scanner up to 5 metres long to focus the beam. However, once produced the beam will produce fewer side lobes and travel further along the surface, resulting in a greater maximum range. Another advantage of S-band radars because of their longer pulse length and greater power is that they will be less affected by attenuation than X-band radars. S-band radars are suited to long range landfall navigation and early detection of targets for collision avoidance, due to their superior range and the cohesive quality of their pulses. On the negative side 10 cm radars require a larger scanner, greater power and often a longer pulse length resulting in a loss of definition at short ranges. A 3 cm radar is nearly always the preferred choice for small craft due to the greater power and scanner size requirements of 10 cm radar. What are characteristics of a RADAR? VERTICAL BEAMWIDTH (VBW):It is the vertical angle at the scanner contained between the upper & the lower edges of the radar sets beam. As per the IMO standards the radar set should function if the vessel is rolling or pitching +_( PLUS & MINUS) 10 deg without deterioation. Marine sets have a VBW of 15-30 deg. It is the horizontal angle at the scanner contained between the leading & the trailing edge of the radar beam . It causes all the targets to appear larger in azimuth by an amount equal to half the HBW . Due to the pulse length the point of the PPI appears to have a radial depth of half PL in meters. It is the time interval between the time taken by the pulse to leave the leading and the trailing egdes. 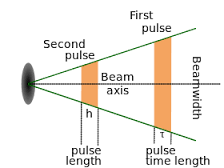 It is the number of pulses set out through the scanner in one second. It is between 500-4000. Longer ranges have low PRF .Shorter ranges need high PRF for better picture resolution. 3 CM : GREATER ATTENUATION ,LESS DIFFERENCE ,GOOD FOR SHORT RANGES. 10 CM: LESS ATTENUATION, MORE DIFFERENCE,GOOD FOR LONGER RANGES. What are limitations of RADAR? It is the ability of the RADAR set to clearly distinguish two small targets on the same bearing at slightly different ranges. The distance between the two targets is equal to or less than ½ PL . The TR circuit prevents the TX of any signal before receiving it. Hence, the theoretical minimum range of detection is repeated by half PL in minutes. A PL of 0.2 micro would have a range of 30 mtrs. A small delay occurs in the TR cell between the completion of TX & Receiving. A delay of 0.5 microsecond would increase the minimum range a further by 7.5 mtrs. Height of the scanner increases the scanner , the increase of range. Power of the set, marine radar set transmits around 25 to 60 kwt. Pulse Length: Long pulses ensures better maximum ranges than shorter pulses cause , Long pulses have more wavelength in them. VBW/HBW: The narrower the beam width the greater the directional concentration, increases the range. Super refraction causes an increase in maximum detection range. This is caused due to meteorological factors like temperature inversion. According to IMO performance standards the error in the range of an object should not be more than 1.5% of the maximum range scale in use or 70 mts whichever is the greater. According to the IMO performance standards the object should be measured with ( PLUS & MINUS) +-1 degree of accuracy. What are unwanted echoes and signals appear on Radar screen? What are errors of/in Radar ? Where Radar antenna be placed / kept onboard? Why S-band radar is suitable for long range detection than X – band radar? How Radar is set up for operation /What are method of setting up a Radar? How to check/calculate efficiency of Radar? What are controls of RADAR? What are Operational checks in Radar? What is VDR OR Voyage data recorder ? What data items must be recorded by the VDR as per IMO Resolution ? What are factors affecting ship’s manoeuvring?